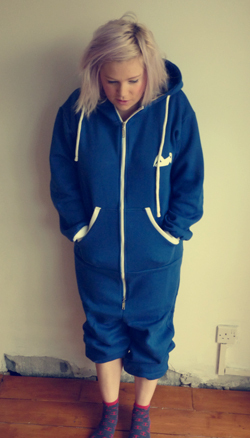 After a lot of cruising round eBaying, Googling and thinking I was going to have to resort to ordering from America I finally found my perfect onesie. I know there are a lot of people against the onesie, and I know they’re not exactly the height of fashion but dammit are they comfortable! This one was a bit more than I wanted to spend but I sold about £90 worth of stuff on eBay last week so I felt justified in splashing out! Today we took Bodhi on his first walk. We had to wait until he’d had all his jabs for him to be allowed out. 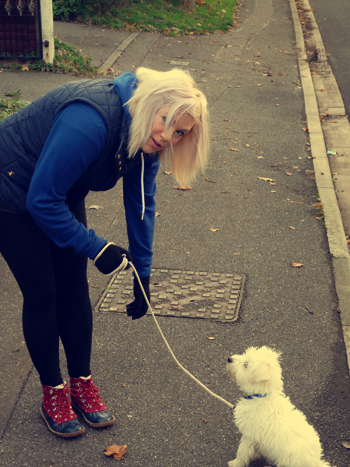 This is me teaching him to sit before we cross the road. 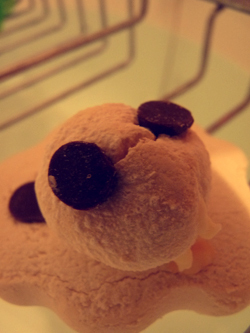 I splashed out on some bits in Lush this week, including this little Melting Snowman, as recommended to me by Lily. I also bought some Glogg and Snow Fairy shower gel and some other bits for Christmas prezzies. I had the melting snowman in my bath last night and he didn’t disappoint – my skin felt so soft afterwards and smelt very yummy! On Tuesday we went to a friend’s house for mulled wine, fajitas and pumpkin carving. The two on the left belong to my friend and her boyfriend, and the two on the right are mine and Tom’s. Tom went for a classic skull design (and of course it was brilliant) and I took on something way beyond my skill level and tried to carve Oogie Boogie from Nightmare Before Christmas. It was a bit of a fail! 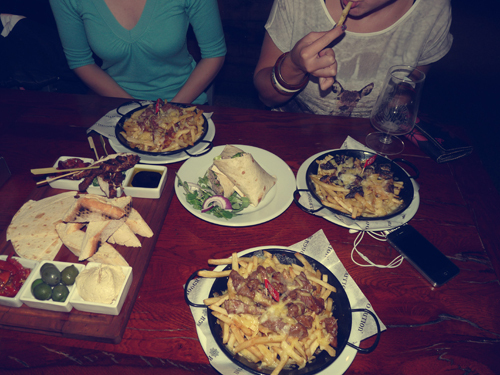 On Monday myself and two friends went to Revolution for dinner as they do 2 for 1 on food. Because of this we decided to order quite a large amount of food, although it still only cost about £7 each – bonus! My favourite is the Denver Fries – fries with peppercorn steak and cheese on top – yum. A few months ago I bought a voucher from Groupon for the value of £85 to spend on Photoart Warehouse. 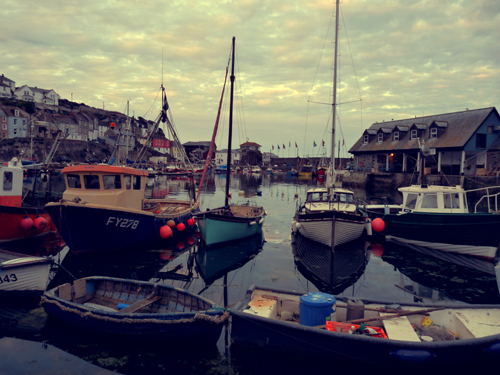 I decided to get this photo taken in Polperro earlier this year printed on acrylic – I hope it looks good!